1).Which of the following company has acquired the Semetric Limited? 2).Which state Cricket Association is facing serious fraud charges recently? 3).Mailavarapu Surya Narayana was a famous actor of ______? 4).Who is the Indian Socialist that has been appointment in UN peace-building panel? 5).ZimaFest is a musical festival of India and ______? 6).Reserve Bank has simplified the procedures for ECB policy, here in ECB, ‘C’ stands for? 7).Which of the following bank has signed as agreement for 100 million euro with a European Investment Bank for leading to private business in the Country? 8).India was observing the National Girl Child Day since_____? 9).National Girl Child Day is observed on? 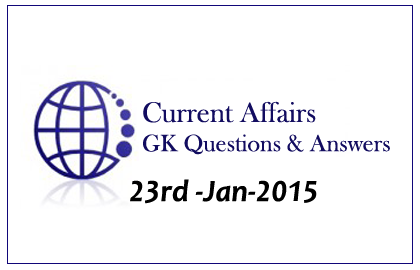 10).RBI has banned to carry the Indian Currency Notes of denominations __________ to, and from Nepal?